Decorative sterling silver and silver plated wares can add beauty and elegance to a table or buffet. But what about caring for those pretty candlesticks, serving trays and chafing dishes? Won't they just tarnish and become a burden that you'll never use? Believe it or not, whether you inherited them from a family member or received them as wedding gifts long ago, those intricately decorated silver pieces were meant to be used. With regular and proper care, most silver pieces will stay beautiful for years and years so you can enjoy them for holiday gatherings, bridal showers, and other occasions where you want to dress up the table for your guests. 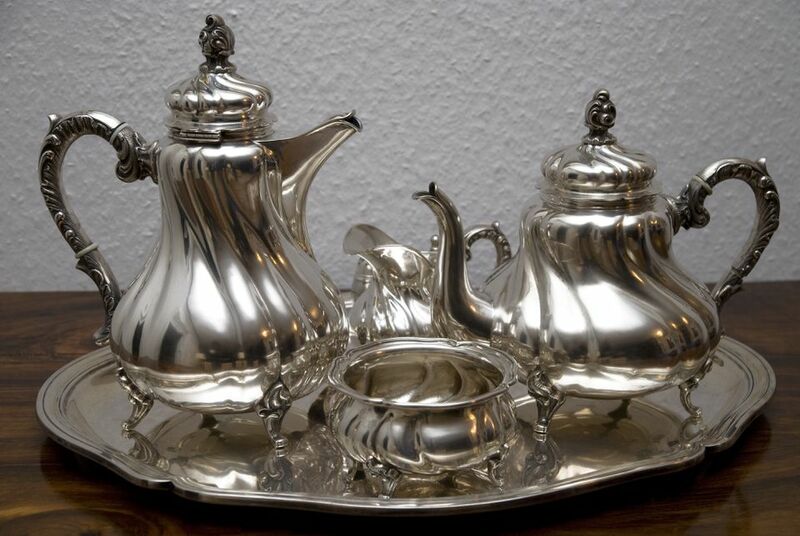 Many people shy away from collecting and using sterling and silverplated wares due to a fear of tarnish without realizing they can make an effort to avoid it. What's the most common culprit when it comes to tarnishing that pretty silver? That's an easy answer: humidity. The ideal level of humidity for storing and displaying silver, according to Caring for Collectibles by Ken Arnold, is 45 to 50 percent. Since most of us don't live in museums, it won't always be possible to maintain a constant humidity level. Making an effort, however, to keep silver out of unusually damp environments such as attics and basement will certainly help if you live in a damp climate. If you're storing silver in a display cabinet, camphor blocks can be added to help prevent tarnish, but don't let them actually touch the silver pieces. Special anti-tarnish papers and cloths containing activated carbon or silver salts can be placed in display cases as well. You can purchase these items from jewelers or department and specialty stores where new silver pieces are sold. There are also special anti-tarnish bags you can buy to place individual pieces inside. While these do work for the short term, you'll probably still have to do a little polishing here and there when you take the pieces out to use them. It won't be nearly as extensive as if you hadn't taken any measures to prevent tarnish at all, however, so it's worth the effort. Avoiding excessive tarnish buildup in the first place is a good idea. This makes cleaning occasionally much easier. However, excessively polishing silver can wear down the finish, especially on silverplated pieces, so take care not to overdo it. Another thing to remember is the importance of cleaning silver immediately after it is used. This is especially true with foods containing eggs, vinegar, salt, and condiments including mustard or mayonnaise to avoid sulfur buildup that may induce tarnishing. First, use a soft-bristled brush or clean cotton cloth to dust the piece. While this may seem unnecessary, it's important since dust can easily turn into an abrasive and scratch the finish if not removed before applying cleaning solutions. Candle wax can be removed from a silver holder by simply running hot water over the area containing the wax. The softened wax should be easy to pry out with a finger. Never risk scratching the piece by using a knife or other sharp object. Once all dust and wax are removed, wash the item by hand with warm water and a gentle dish washing soap to remove any food and gunk, but don't soak the silver in water for any length of time. Rinse the piece well with clean water, distilled is best, and dry immediately with a soft, lint-free cloth. A hair-dryer set on warm helps to dry hard-to-reach places. Wearing plastic gloves rather than rubber (rubber can react adversely with the silver), lay the item on a soft towel work surface. Use a soft cotton cloth or sponge and a good non-abrasive commercial silver cleaner or polish. Arnold mentions Goddard's, Gorham's and Wright's as possibilities in his cleaning guide (see page 1). Some people find foams and liquids easier to manage than pastes, but it's really a matter of personal preference. Apply the polish in a gentle circular motion. For intricate areas, use a cotton-tipped swab to apply the cleaner. Make sure all polish is removed when you're finished, using additional cotton swabs if needed. Once the piece looks clean and shiny, stop polishing even if you're still seeing dark residue on your cloth. Taking heed of this advice will help you preserve the plating on silverplated pieces. Wash the piece again as noted above and dry with a lint-free cloth. Items not used for food consumption can be waxed with a thin coat of microcrystalline wax to further protect against tarnishing, if desired. For smaller pieces of silver, like flatware or jewelry, some people swear by a non-chemical cleaning method accomplished using common household ingredients. By combining liquid fabric softener, salt and tepid water in an aluminum pan, a solution can be concocted to soak silverware clean. After soaking for about 15 minutes, check your progress. Soak for another 15 minutes if needed. Remove each piece from solution as soon as the tarnish dissolves, rinse with clean water and thoroughly dry with a soft cloth. Any residual tarnish can easily be removed using a silver polishing cloth available at most drug and grocery stores. You can try this cleaning technique on something you do not mind experimenting with first (a cheap piece of tarnished silver jewelry works well) to see if you like the result. If you do, move on to other silver items you'd like to brighten up. Just keep in mind that you don't want to remove all the patina from silver jewelry, especially if you want to sell an item any time soon. Collectors value pieces that show a little age without being totally consumed by tarnish. Whether you store or display your silver and silver plate after it's thoroughly cleaned and polished up, use caution. Certain materials and finishes have been known to cause an adverse chemical reaction with silver, which can lead to heartbreaking damage. After your pieces are clean and completely dry, wrap each of them individually with acid-free buffered tissue, or washed cotton, linen, or polyester to store. Wrapping pieces in specially made bags or silver cloths designed to deter tarnish make good storage choices as well. Do not use wool, felt, chamois leather or newspaper, which can cause excessive tarnishing that will be difficult to clean, or even worse, remove plating. Once the plating is damaged on a piece of silver plate, it is very costly to repair and replating a piece of antique silver will considerably diminish the value unless it's an extremely rare piece. If you'd like to display your silver rather than storing it, a glass-enclosed cabinet makes a good choice. Just be sure to avoid unvarnished wood shelves that can omit harmful vapors. And if you use glass shelves, make sure they're sturdy enough to hold heavy silver items. Camphor blocks can be added to the cabinet to help prevent tarnish, but don't let them actually touch the silver. Special anti-tarnish papers and cloths containing activated carbon or silver salts can be placed in display cases as well. You can purchase these items from jewelers or department and specialty stores where new silver pieces are sold, along with directions on how to use them safely. You'll want to avoid displaying or storing silver near cotton felt, wool or velvet as well. These fabrics contain sulfides that attack the metal. Direct sunlight doesn't actually cause tarnish, but it can accelerate the progression of the unattractive film, so place your silver display case away from sunny windows for best results. When handling silver between cleanings, you'll want to wear white cotton gloves whenever possible. If you don't have gloves handy, use a clean, soft cotton cloth to cradle the item as you move it around. This is necessary to avoid leaving behind salts, oils and acids found in your skin which can cause corrosion if they aren't immediately removed from silver and silver plate. Arnold's book (see page 1) also mentions that fingerprints can even be etched into silver if left uncleaned for a long period of time.